The next HACCP manager certification class in West Michigan is scheduled for December 5 & 6 at the Varnum Law Firm in downtown Grand Rapids. This is a great investment in your food safety education. Call Amy at 616.771.0557 for details. Call Jody Gruner at 616.771.0557 for details. We used canningusa.com’s recipe. We each increased the ingredients by 1.5. There were three of us moving through and we made one batch. We achieved 7 quarts each of shelf – stable product and 2 quarts to be refrigerated and eaten soon. We started Sunday at 1:00pm and finished at 10:00pm. It turned out great but…Wow… we were exhausted by the end. Laurie Brooks, with Facility Kitchens, and leader of the pack – she used all venison. Greg Grieves, of Saranac Tank and Coating – he used 50/50 beef and venison. 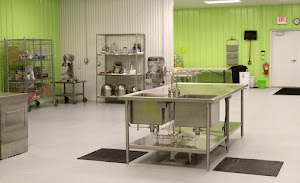 Janet Tlapek, also with Facility Kitchens – she used all beef. Other ingredients were onions, shallots, mushrooms & bacon. Here ingredients are sauteed in olive oil before adding the wine & cognac. There is prepping, lots of prepping. There is a significant amount of wine and cognac in the recipe and all of us substituted brandy for cognac. There is simmering, lots of simmering. This must be the color of beta- carotene. There is more simmering, now with carrots. Filled jars went into the pressure canners for 75 minutes at 10 pounds of pressure. Voila! Here is our finished product of Beef Bourguignon. Each of us achieved seven quarts of shelf-stable product and three quarts that are to be refrigerated and eaten in the near future. For our next personal food preservation session, we plan to do pork & beans, spiced apples, or Sloppy Joes. Check back for dates and details. We have some spots available for our Beef Bourguignon event today at 1pm. Please email Janet at Janet@facilitykitchens.com to reserve your place. Don't forget our special event tomorrow! We will can Beef Bourguignon, an iconic French dish of beef with vegetables in aromatic herbs. 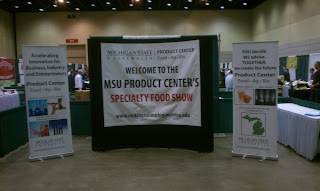 At our Thursdays Powwow we talked about accounting and distribution in the specialty food business. Sharing ideas with others in similar businesses can turn production into profit. Our featured food for the evening was barbecue from Pit Stop Catering. Don't forget that this Sunday, Nov 11th is our Beef Bourguignon Night! 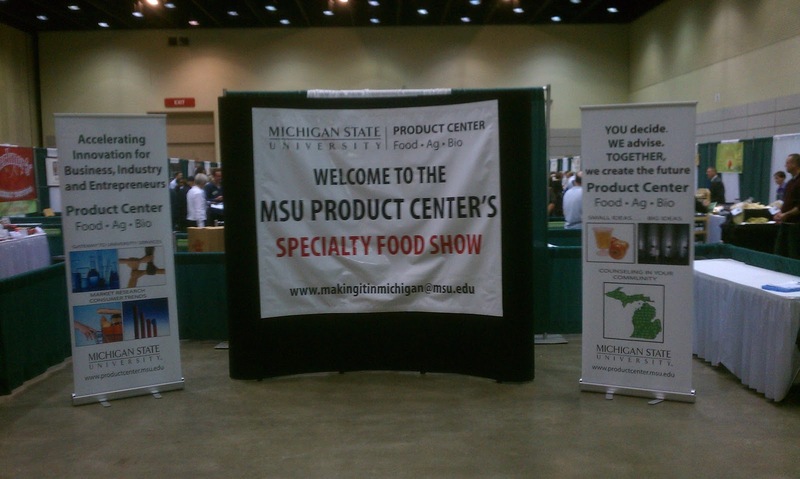 Lance Ramier of S&D Distribution, who distributes for Facility Kitchen producers, sent us this photo of the opening of the Making it in Michigan Food Show from Thursday in Lansing. He reports that distribution is a vital link for every specialty food producer and he can help here.